For years, patients have viewed root canal therapy as one of the most dreaded procedures performed in a dental office. It used to require more than one appointment to complete and took a substantial amount of time. Patients would often choose to sacrifice the tooth, rather than go through the process of treating and restoring it. Unfortunately, this eventually left patients with the problem of too many missing teeth and resulted in a large investment to replace them. Now days that situation may easily be avoided. Thanks to the advanced training and techniques practiced by our dentists, root canal therapy is a relatively simple procedure, done with little or no discomfort. It is important to remember that root canal therapy gets rid of pain and infection, not cause it. Though teeth themselves are very strong, durable structures, the canals are filled with nerves, blood vessels and connective tissue. When aggressive decay begins in a tooth and is left untreated, it will eventually invade the pulp chamber, or nerve of the tooth, resulting in a painful infection. Injury to a tooth may also cause the tooth to "die". 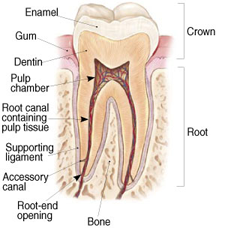 In either situation, our dentists would go in and remove the pulp and the diseased tissue from each canal. The canals are then sealed off and the tooth is crowned to restore the strength and return it to a natural looking state… many times in just one visit! Pain in jaw and/or ear on affected side. Unable to chew on affected side. Swelling in face on affected side. “Bump” on gum next to painful tooth. Unable to fall asleep or stay asleep due to pain. Need pain medicine to get thru the day. Root canal therapy has a success rate of over 95%. Our dentists here at Riverview Dental will make it as simple and easy as possible! We offer soothing nitrous oxide for patients who just need to "take the edge off". If you would rather have little to no memory of your visit, then you may choose our relaxation method! Please call our office today and let our caring team help you make the decision that’s right for you!